I haven’t experienced any rug shedding but we did spray it with scotch guard and let it dry for a few hours before laying it in the living room. It’s certainly a high quality rug, you can tell when you step on it how durable it is. I bought it as a 6x9 and I’m happy with my purchase. Safavieh's Cambridge rug collection is the perfect blend of contemporary and traditional. This hand-tufted rug features a traditional ivory colored Moroccan-inspired trellis pattern set on a light blue background that will blend perfectly with contemporary design themes. Crafted with premium wool materials and a sturdy cotton canvas backing, this rug works well in just about any living space, especially high-traffic areas. For over 100 years, Safavieh has been crafting rugs of the highest quality and unmatched style.Click here to learn more. Please keep in mind that new wool rugs may initially shed and have a natural capacity to shed for several months after purchase. This is normal due to the nature of construction of most wool rugs and not a defect.Click here to view our Wool Rug Care Guide. I read the reviews over and over and it took me 2 weeks to decide to buy this rug in 8X10. It was on another site for $3.00 more, free shipping, free rug pad with no reviews. I decided with my club O rewards, free ship and what I would earn buying it here I would come out ahead, I always do, plus I got this in 4 days, that always keeps me coming back, not having to wait weeks for something. After reading the reviews I knew I would not need the rug pad. I never buy anything online now without reviews. It came today. I opened it in the sunroom, full sunlight and thought, oh no, this is too dark on the tan, off white color. The blue does not look baby blue on mine, but not much darker. Nice easy blue that will go with many things. I had my husband bring it to the living room and open it all the way so I could vacuum it. I have an older Dyson with a huge tank and filled it 6 1/2 times. Never would have believed it but knew from reviews this was a rug that would shed. My husband said he really liked it and after 11 years together I think this is the first time we have ever agreed on anything for the house. It is growing on me. It is in the guest room under a queen bed, the bed is white, the walls medium blue, dresser and nightstand a darker blue. The crown and woodwork white. I thought it was not going to work but it does. The cream now looks almost white, depends on the light in a room. The pattern is more pronounced than I thought it would be and bigger. People said if you want this rug to pop it won't. I disagree. It is not a loud pop but with medium hardwood floors it is just the right amount to "make the room". Gives the room some depth and color and the old room looked very dull compared to now. I do not Love the rug, I think it has to grow on me some, but I find I like it very much. It does have a end that is a tiny bit off. Meaning not perfectly straight but not a deal breaker. All in all I think I made a very good choice. The reasons for not giving it 5 stars are, sheds pretty bad, hope that stops soon, uneven on one end. Nice and thick. A rug pad in my opinion, keep in mind , my rug is under the bed with 3 foot showing at one end and some on each side. This rug is quality all the way and the price is crazy low. We bought it to match the 4' Square rug for our foyer. It really lightens up the space with the sky blue color, yet adds subtle elegance due to the traditional moroccan print. Since we just got it, the wool is shedding quite a bit, but as wool rugs always do, I expect this to diminish with time. I would definitely recommend this to a friend. BTW - cheapest price is right here at Overstock. Plush rug. Not good for high traffic areas due to the light colors. This rug arrived very promptly and was well wrapped. I love how you do not have to wait weeks for Overstock purchases and that the shipping is essentially free-such a plus for a big item like a rug. The rug appears to be well-made, with a nice contrasting covering on the backside. It was more "baby" blue than I thought it would be from the photo and the light area is almost off-white. The colors on my screen looked like tan and a blue/gray color. So it was not exactly what I expected, but it will still work. The off white areas are a little inconsistent in coloring. I believe it is from the natural wool fibers, but it almost looks like there are soiled areas on the rug. I am giving a very accurate review, but need to say in the end I am very happy with the purchase. The quality of the rug is very good; it is an excellent price and you will get it very quickly! This is my third rug I have ordered off of Overstock. Their prices can't be beat! Very pleased with color and quality. The rug is soft but sturdy. This rug is truly breathtaking. The color is exactly how it appears on my iMac screen. The quality is very, very good and definitely far above what it is priced. In my opinion it is definitely a bedroom rug. I bought it for my guest bedroom to pair with an antique bed and it really compliments the bed and freshens up the room. I wish Overstock had a photo that showed the scale of the pattern. I was able to approximate from the pictures shown but will share that the 9X12 which I bought has 8 circles X 10 circles with the hope that that helps someone else who is wondering. Also FYI, I paid for 1-3 day delivery and it arrived at 3pm on the 3rd day. Thank you Overstock for offering expedited shipping. I'm thrilled with this rug and how quickly I got it! Colors as just as shown. Beautiful Rug. This rug was just as described and was perfect for our living area. The pattern is beautiful and the light blue color stands out just enough to add a pop of color. 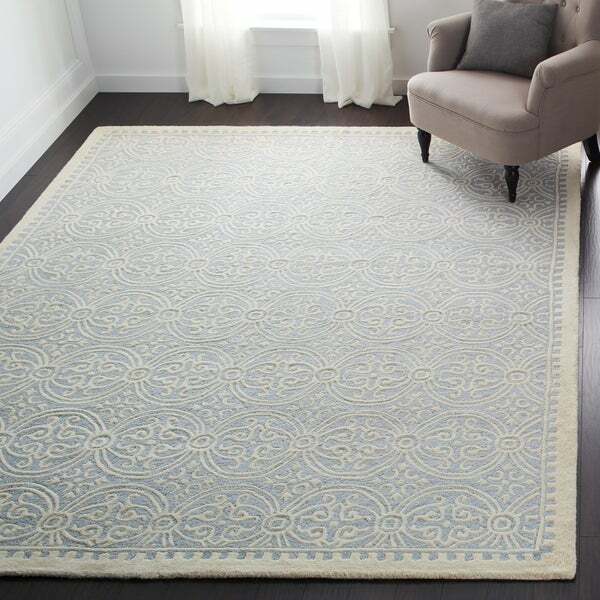 I purchased The Safavieh Handmade Morccan Cambridge Light Blue Wool Rug almost a year ago now, the rug was absolutely gorgeous when I received it, and is still in great condition. The rug does shed a good amount still, but no other issues. I have received so many compliments on this rug. 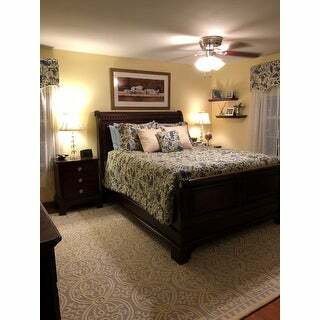 I purchased several of the Cambridge Light Blue Wool rugs in different sizes for my bedroom. I love the colors, very serene and airy, very true to colors on-line. Seems like a very nice quality for the price paid. Very happy customer. Very nicely made but the blue "hides"
This looks very much like the picture and feels like a thick, quality rug. There's one aspect I don't like. From a distance of anything more than a few feet, the viewing angle makes the rug appear almost completely colorless. The blue part of the rug is fairly recessed compared to the ivory pattern. Looking across from another room you don't see anything but an ivory rug. Also, the ivory is just a little dingy looking. I live in Sydney, Australia, and bought this rug for my living room. It arrived in 10 days and I was very happy with it. The colour is lovely and the pattern is not too busy and makes me smile. I would recommend this rug to people who want a bit of subtle colour in their space, mixed with a lovely pattern. My only negative is that the rug sheds a lot. Hopefully it will slow soon! This is my second rug purchase through Overstock and I must say I was not happy with the item that I received. When it arrived it smelled very strongly of musty odor. I unrolled it and thought it might possibly dissipate after time but it did not. I did an online chat with a customer service rep who was quite friendly and agreed to ship me a new replacement right away. He also emailed a return label so I could return it for free. The second rug arrived within days and was beautiful. 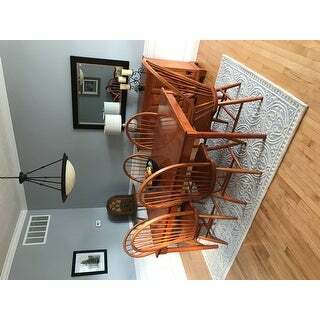 It looks perfect in my dining room and is as pictured and is of good quality. I truly believe that first rug was a returned item that should've never gone out to a second customer. It was even packed differently then the second rug having stitched in labels and the manufacturer's name on the plastic wrap that the other did not have. Overall I'm satisfied with my purchase but not pleased with the first item I received. The quality and color of this rug were very good but, after laying it out and looking at it over various times of the day I concluded that it was too bedroomy for my taste and that I should opt for a different design. This rug looks like a high end floor covering. I have it in my dining room and it looks magnificent. 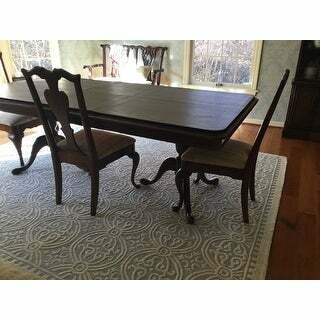 I have purchased Safavieh’s rugs at their Connecticut store and have fallen in love with the quality. However overstocks prices are literally a fraction of what I oaid at the showroom. I love the look of this rug. It is beautiful. It is made well. We have had this rug for less than 6 months and we will be getting a new rug. First, it sheds. Some may say vacuum it and it improves. We have a Roomba which vacuums it 6 days a week and it continues to shed. The second issue is that it shows all dirt. I was naive to think that much light coloring would work. It breaks my heart that this didn’t work for us. So disappointing. I ordered this rug and love the color and pattern, but it is SOO hairy! Because of the massive amount of shedding, I can't recommend it. We are returning it. I do not think the shedding will ever stop, although it decreased after I vacuumed twice. Poor quality fibers! Love, love, love this rug. Shipping was amazingly quick and the rug is absolutely beautiful. Rolled out perfectly flat and there was absolutely no shedding. I would definitely recommend this purchase. It is a pretty rug. The pattern and color look very nice. I have noticed some fraying along the side after a year. Beautiful rug. The blues and creams go so well together. I bought it for my daughters room and she loves it. For the price this is a great rug. I highly recommend it. I absolutely love this rug!!!! Great color, super thick wool which doesn't pill or shed. Beautiful rug. The 3D aspect of the design makes it look richer than the purchase price. It looks elegant, but with right decor, could also be used with shabby chic decor. Love the look of this rug but it does shed quite a bit so we've put it in our guest room which gets less traffic. Really thick and of good quality. Very soft for a wool rug. I purchased this for my granddaughter's nursery. Beautiful, soft rug in an almost neutral ivory/blue pattern that brings just the smallest bit of color to the room you put it in. I did vacuum it upon receiving it (and filled up the whole canister) but no complaints! Gorgeous rug (at the lowest price compared to 6 other websites!) and I’m very happy with my purchase! This rug is not stain resistant. In the event of a stain, make a solution of water, white vinegar and mild detergent. Apply the foam that rises to the top of the solution on the stained area with a clean cloth. Finish using a damp, clean cloth to absorb any residue. "What is the exact length of the 2x3 rug. I only have 34 inch clear space. Thanks. " This rug is intended to be a true 2' x 3'. Please note sizes can vary up to a couple of inches. "Please tell me pile height. Thank you." I can not tell you exactly the height of the pile but I can say that it is one of the most beautiful rug that I have ever seen. I bought the largest and the smallest and they are thick, pretty and well worth the money. "What kinda blue is in this rug? Grayish blue or light sky blue/ baby blue? I've been compare the same rug with silver one, I couldn't really tell much different on the picture, so I am wondering if its actually the same color or one is light/darker then other one. I will be appreciate if you can answer me this question. Thank you!" It is definitely blue. I would say closest to chambray blue. "I would like to order few of these, but I have to know if the rug sheds? Now I have Safavieh evoke and it is the best rug ever!!!! It doesn't shed even as bit. I really love the look of this rug and would like to purchase it, but have to know if i lay on it with dark sweatpants is it going to be all white on me or not?" We have had this rug down for about two weeks now and have had no problems whatsoever. It is just plain gorgeous and seems to brighten up the room. Love the way it is made. Seems like whomever made it put a lot of time and effort into it. I just love Safavieh rugs. As for the lint going onto your clothes, haven't tried that yet. Also, you get a real bargain at Overstock. When this one came in, it was real heavy - one way to know that it was wool. Enjoy! "Are these wool rugs non toxic to pets?" "Can this rug be used outdoors?" No. This is an indoor only rug as it is wool which wouldn't do well in the elements. No, it's for indoors use. Safavieh Handmade Moroccan Cambridge Light Blue/ Ivory Wool Rug - 7'-6" X 9'-6"